After a number of convention exclusive releases, Funko is finally producing not one but two new mass market iZombie Pop! 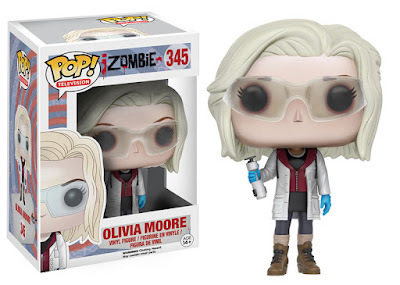 vinyl figures of the show’s resourceful hero, Olivia Moore! Seattle PD's most helpful zombie comes dressed in her medical examiner garb and comes available in two versions: Olivia with glasses and bone saw or Olivia with a bowl of brains! Each iZombie Olivia Moore Pop! Television Vinyl Figure stands 3.75”, features one point of articulation and come packaged in a full color displayable window box. These awesome DC Comics figure can pre-ordered now at Entertainment Earth for $10.99 each here.